People often ask me where the inspiration for my blog posts comes from. Whilst there is no single answer to this question, I will say that the best blogs are usually those that are unplanned. In other words, I am regularly inspired by the things I see and hear – my posts will almost always be as a result of a recent experience of my own. At the weekend, I was fortunate to hear a sermon from a retired Anglican Priest. I must admit that I was not particularly focused in absorbing what he was saying. I did hear him repeat three words at least three times though – those three words were ‘Dignity in Diversity’. I heard the words, but they did not really touch me….. not until my wife brought them to my attention again a little later. The Priest was describing the importance of being different – trying something new. In what I now recognise as a very poignant speech, he was telling those that were listening why there is actually something to be proud of in driving and accepting change – change is not a bad thing, it is a good thing. It is his speech that is the inspiration for this post. Delivering great Customer Experiences – consistently – is all dependent on an organisations ability to repeatedly and continually evolve/adapt/change/transform (delete or include as appropriate). Continually doing what you have always done is rarely a recipe for success – it is almost impossible to stand still as the world and the people who populate it (your employees and customers) constantly demand something different…. something better. 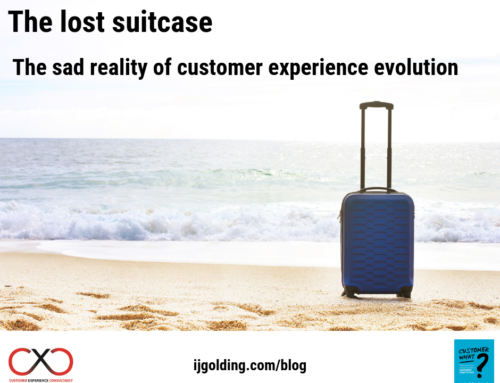 Therefore the discipline of Customer Experience is all about knowing what and how to change – easy to say, yet not so easy to do. There are challenges with both the ‘what’ and the ‘how’. Let us explore knowing ‘what’ to change first of all. For me, this is the bit that requires a structured, fact based approach to Customer Experience. 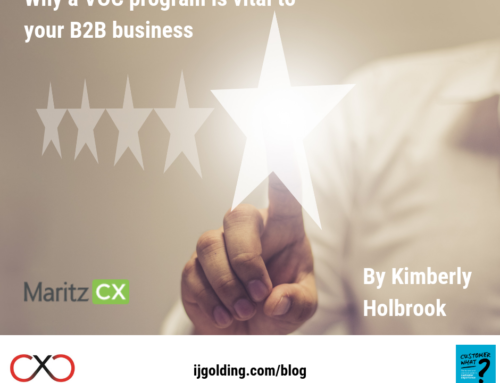 This is where it is critical that a business understands what it is supposed to be doing for its customers and has a clear understanding of what works and what does not. The problem is that too many businesses still make decisions on what it is their businesses should focus on without putting customer focused facts on the table. It is still very common for companys to look towards their competitors – often from only their own industry and attempt to do the same things……slightly better. Either that, or they look to who they consider to be the best and attempt to emulate them – if only I had a £ or a $ for every time a senior leader has told me that they would ‘like to be like Apple’! This is where the headline from this blog post comes in – Dare to be Different – there really is dignity in diversity – we should aspire to be different, not the same as everyone else. There is nothing wrong in learning from others, both inside and outside the industries from which our own businesses exist. However I strongly believe that our organisations should have the dignity to be as diverse as their customers need them to be – as different as they need to be – to constantly provide customers with better Customer Experiences. 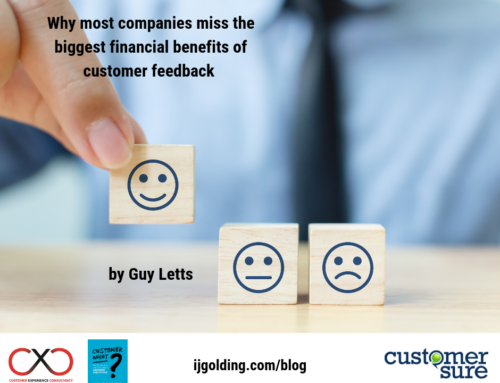 In my time leading Customer Experience programmes, I have often been ‘knocked back’ for suggesting things that have not been done before – or that have never been tried by another company. ‘Dignity in Diversity’ is a different way of saying ‘Dare to Try’ – it plays to innovators and transformers. Being different is not a bad thing – it is what can truly make your business differentiate itself. To enable your business to change it is vital to unlock the potential that comes from within – this is the ‘how’ to change. Don’t be constrained by the negative (it has never been done before); look to the possibilities of being the first to ‘dare to try’! 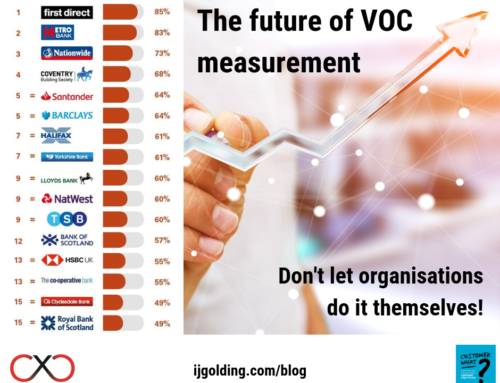 In my final blog post of 2014, I suggested that we should ‘sweep the steps’ of Customer Experience in 2014 and move onwards and upwards to the land of opportunity ahead of us in 2015 – we could do this by truly daring to be as different and as diverse as our customers really want us to be. So go on – give it a go – don’t dare to dream of being like Apple – dare to dream to be the first to do something that has never been done before!